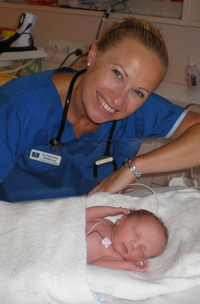 Graduating from Flinders Medical Centre (Adelaide) in 1997, I enjoyed 15 years working mainly in Neonatal, Paediatric and Maternity Health in various hospitals around Australia, and the last 6 years in General Practice. During that time I have been awarded a Diploma in Child Health and completed the Primary Course at the Australasian College of Nutritional and Environmental Medicine - an area of medicine that is also of particular interest to me. I have long had an interest in media work and have been lucky enough to pursue this passion with acting, voice over and TV presenting work, including numerous medical educational videos, corporate/promotional videos, corporate voice-over work and as an on-camera medical expert on Foxtel’s “The Little Things”. I was also lucky enough to have a starring role in a feature film “Guardian” released in Adelaide cinemas October 2002. My focus now is on corporate speaking events and educational workshops and seminars. My medical career, media background and becoming a mother, led me to this exciting project which involved scripting, presenting and voice-over work on a series of maternity educational DVDs focusing on common post-natal issues. Already used with great success in all Ramsay Health Hospital Maternity Units and by parent educators Australia-wide, the DVDs are also stocked in CAPERS and Birth International online bookstores and Kanopy Streaming and DVD webshops. Working in General Practice allows me to continue my work in womens' and childrens' health, and to practice Integrative Medicine (a combination of traditional and evidence based complementary medicine) with a particular emphasis on the use of nutrition, vitamins and supplements to optimise health. I hope you enjoy this website and the DVDs, as much as I enjoyed creating them!